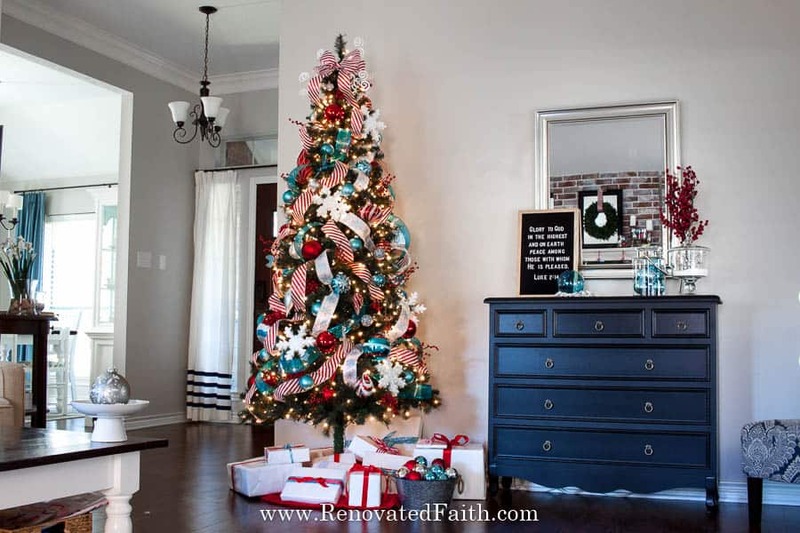 Decorating a Christmas tree can seem overwhelming, especially when you want to get the look of those designer trees you see on Pinterest. 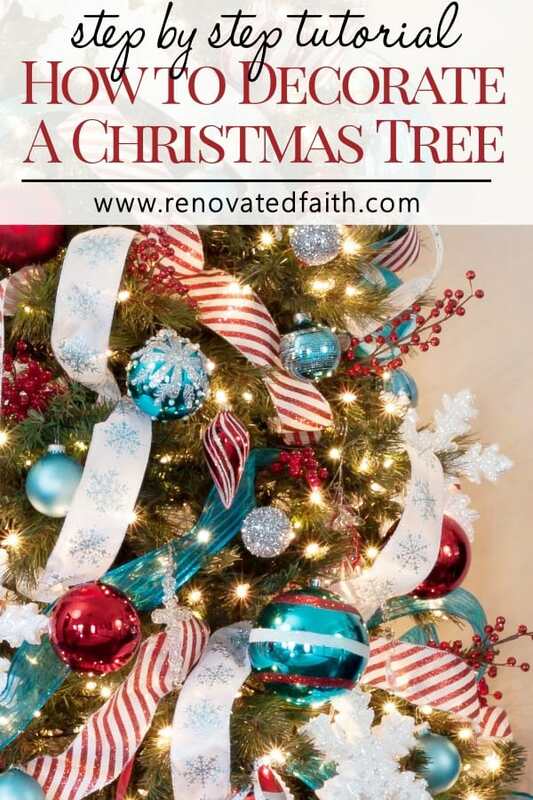 Here I’ll give instructions step by step on how to decorate a Christmas tree like a pro including some tricks and tips to help you out along the way. 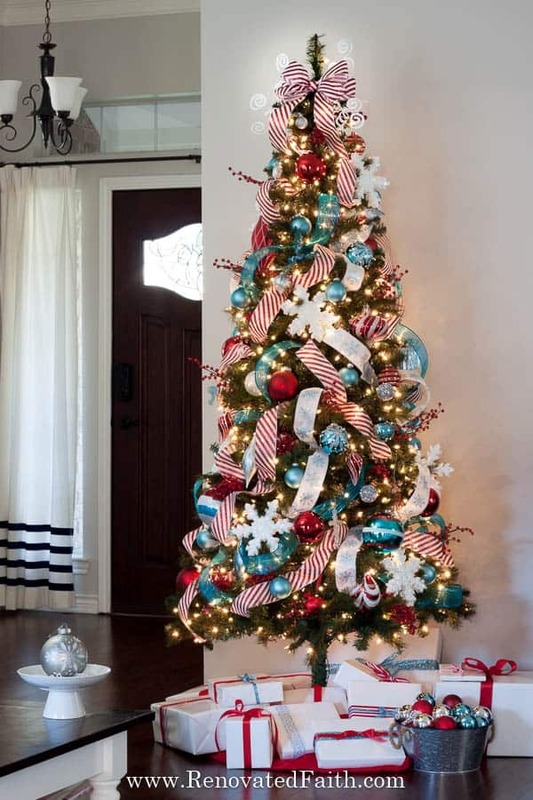 How to Decorate a Christmas Tree Step by Step (Adding Ribbon on Tree-Ideas and Hacks). 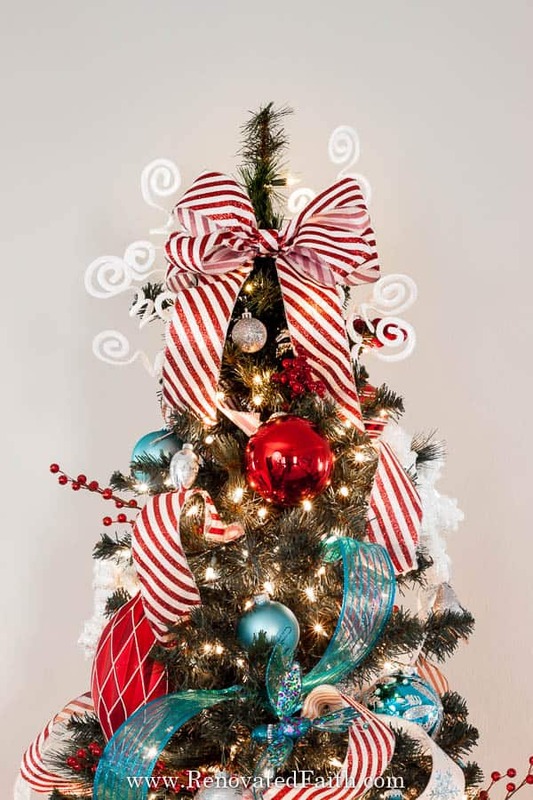 Before you go shopping, you need some Christmas tree inspiration so head to Pinterest to get a game plan. Once you have created a Pinterest board, narrow it down to under 3 favorites and decide on two or three main colors. I picked red and turquoise with some white. Also, decide if you want to add in some silver or gold accents. Some affiliate links may be used at no extra cost to you. View my full disclosure here. Wired Ribbon – Here’s the best selection I’ve found. I use 2″ to 4 inch wired ribbon on trees but this year I used all 2.5″. Be sure the ribbon is wired! Lights – These are the LED’s I bought and they have multiple different settings. 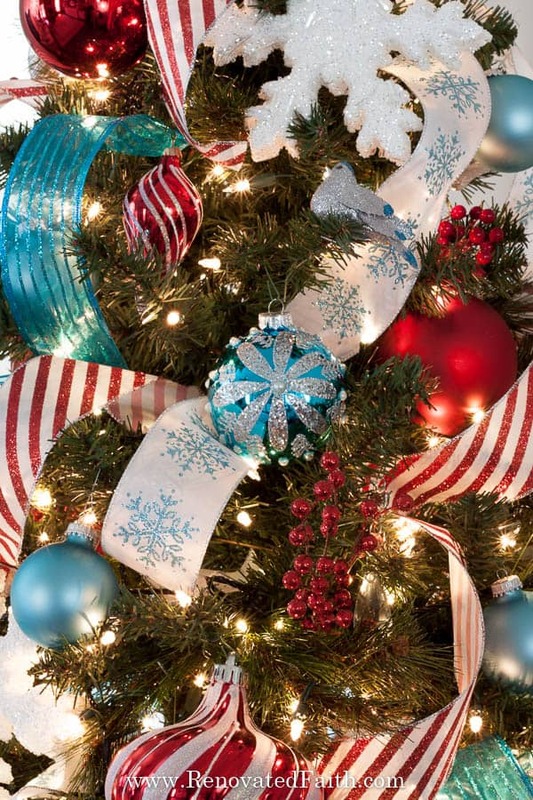 Christmas Tree Ornaments – Regular Sized Ball Ornaments – If you buy ornament sets online like these, make sure they are the 3.15″ ornaments and not a smaller version. Christmas Tree Skirt or Christmas Tree Collar – I personally used a white sheet because the gifts cover it anyway, but I LOVE these Christmas tree collars. Maybe next year! A tree will never look like a designer tree if you can see straight through it. And no amount of ornaments and ribbon is going to fill in those big gaps. After you fluff each branch of the tree, I recommend using this to add a little more fullness to your tree. This garland was less than $5 at Walmart but it made the entire tree look like I paid a lot more for it than I did. I simply weaved the garland between each row of branches paying special attention to the bare spots. Doesn’t that make a huge difference?!? Even if your tree is already pre-lit, consider adding more lights as professionally decorated trees have more than 100 lights per foot of height. For example, our 7.5 foot tree had 500 lights. That sounds like a lot but in past years I regretted not adding more. This year I finally did and it made all the difference with this extra strand of lights (check the current price here). 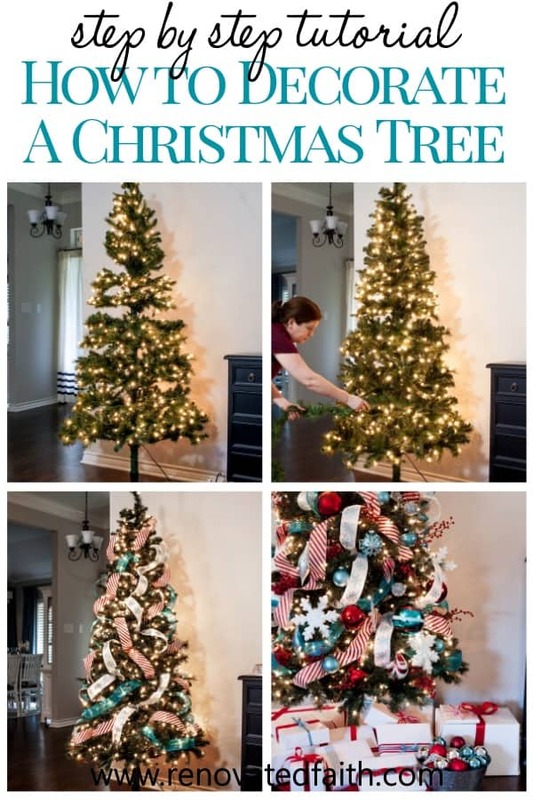 There are several different ways to add lights to a tree. 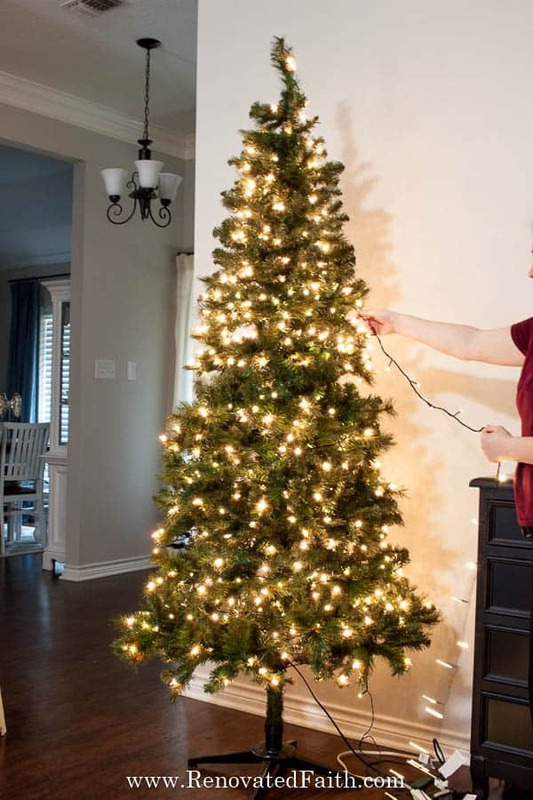 If your tree isn’t already pre-lit, I recommend adding lights to one branch at a time by starting towards the base of one branch and running lights up to the tip and then back to the base and the same for the branch beside it. This way adds a lot of depth to the lights in your tree. 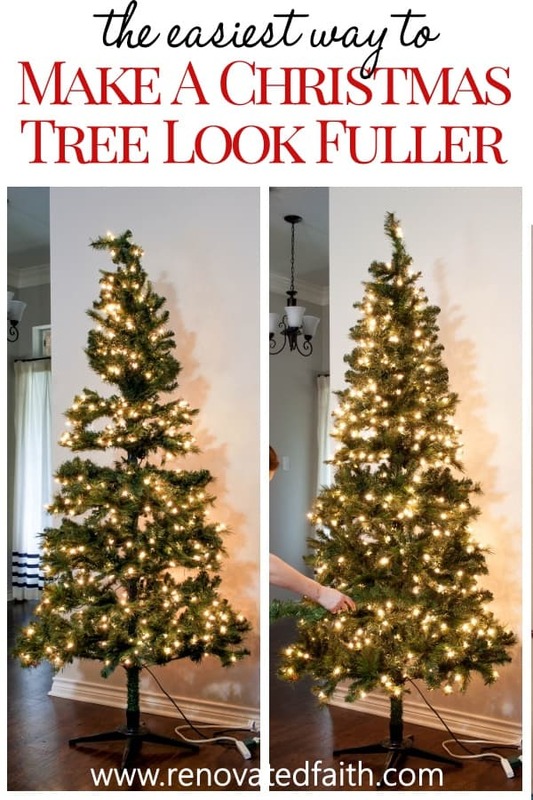 If your tree is pre-lit, add additional lights by going back and forth like the picture below. Since you already have lights in the innermost parts of the tree, this is the easiest, least time-consuming way to add lights. If you have extra lights one you get to the top, right them back and form from top to bottom again, filling in any areas that look bare. 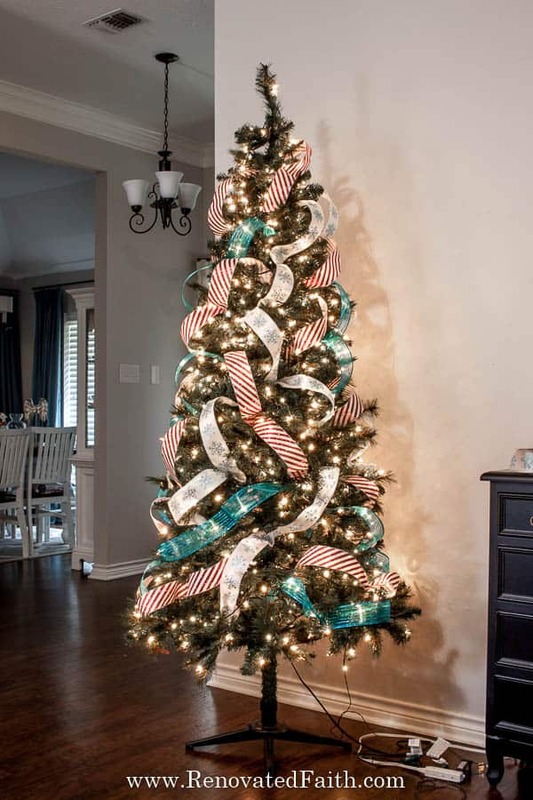 If you want to know how to decorate a designer Christmas tree, you need to add some ribbon BUT it’s a whole lot easier than you think with one simple trick! 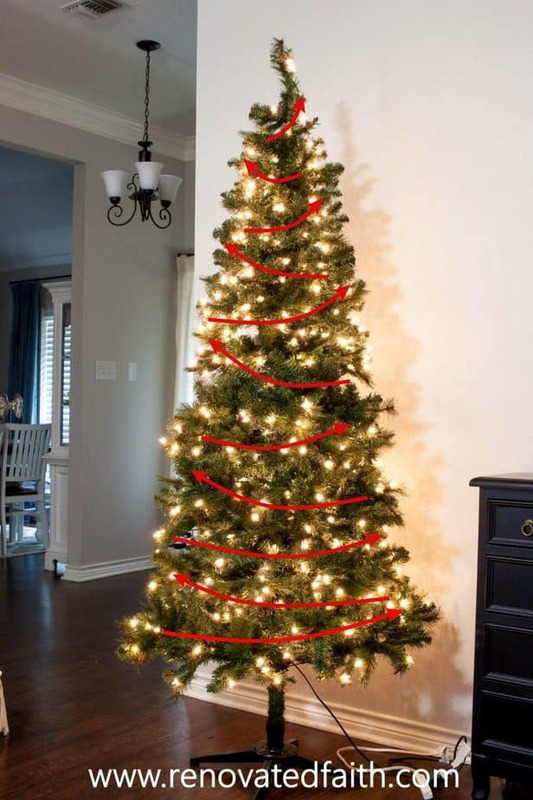 Make sure you use wire ribbon for your tree because it will be easier to bend in and out of the branches. I like to use ribbon that is 2.4” to 4” in width. 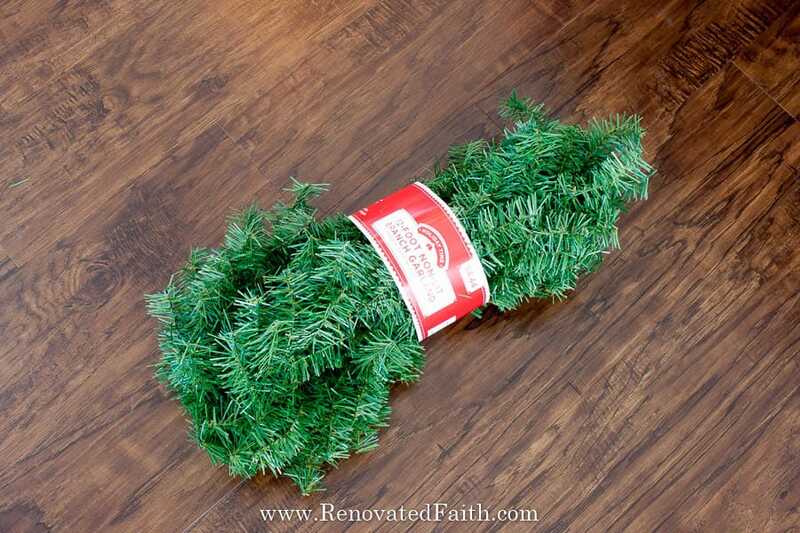 For my favorite source of Christmas tree ribbon, click HERE. 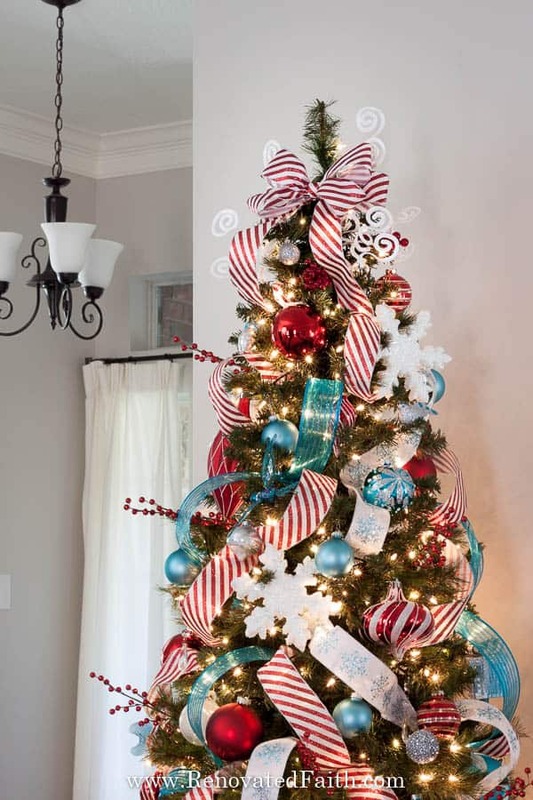 I go in-depth on the easiest way in my Adding Ribbon to Christmas Trees Tutorial. 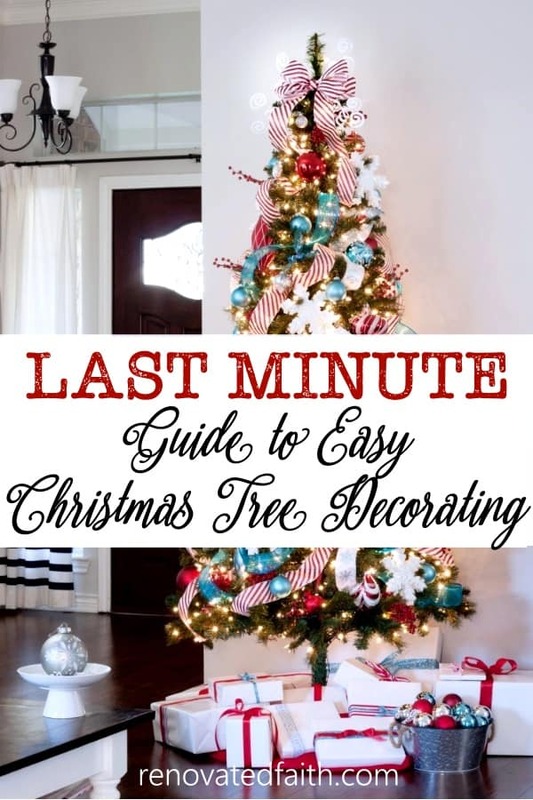 It’s even complete with a step by step video so you can decorate a Christmas tree like a pro. Then come back here for the rest of the tutorial. Usually, I use a star at the top, but this year I opted for a big bow. I used the same short cut as I did in my post How to Make a Burlap Bow. No one will know (or care!) that you cheated and your bow will look stunning! 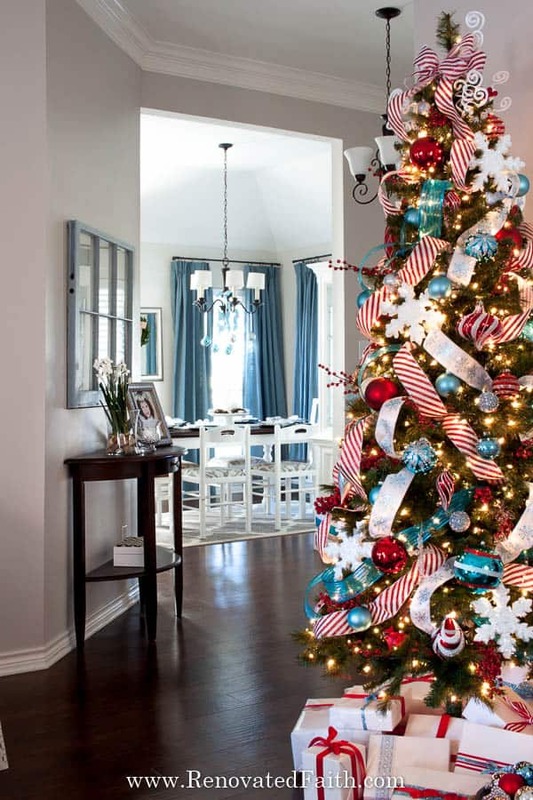 Designer trees are interesting trees and what makes a tree interesting is that it has varying sizes and shapes of ornaments although they fit into the same color scheme. I promise this is easier than it sounds! Remember those 2 or three colors you picked for your tree? You are also going to use those colors and possibly a neutral metallic (silver, gold, copper, etc.) for your ornament colors. But you don’t want all the same size of ornaments because that’s boring. I like to get about 5 or 6 really large ornaments and nestle them in the branches of my tree – mostly in the bottom two thirds as they will be too big for the top. You can use green pipe cleaners like these, to adhere them to the branches if you’re concerned about them falling off. 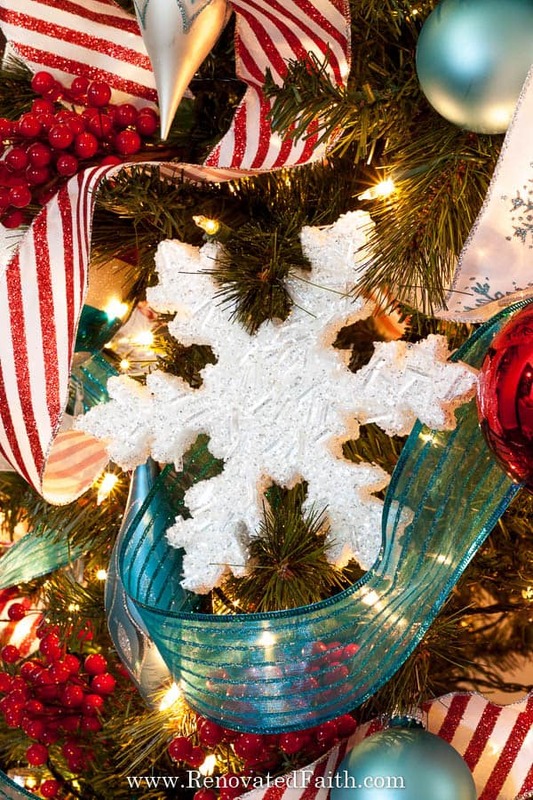 Once you have added your large ornaments, you can fill in with the rest of your ornaments in “holes” and to cover the inner “bends” of your ribbon like below. 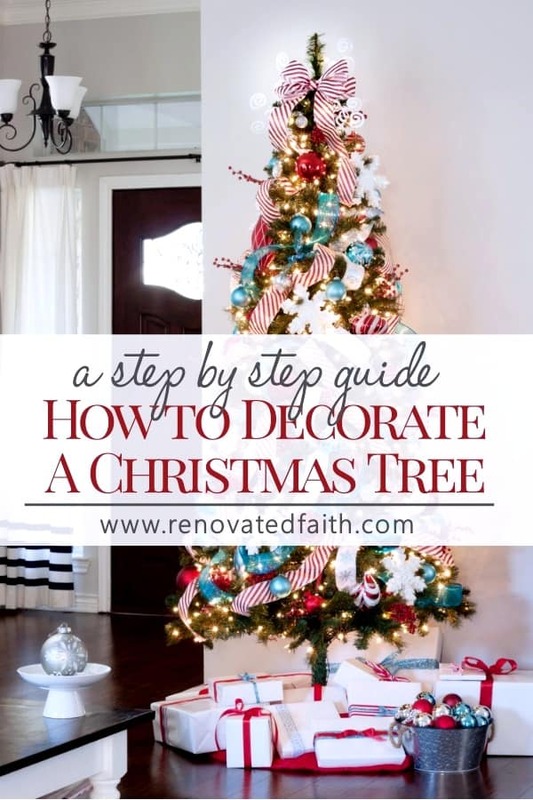 The last phase of decorating a Christmas tree step by step is to add an “interest factor”. You can do this by adding various picks or even snowflakes. I’ve also seen someone add big bows instead of snowflakes. The possibilities are endless! I love how it looks like the ends of the bow continues in and throughout the tree. This combinatiom of colors already coordinates well with all the blue in my home and they are still whimsicle and not-too-stuffy for my eight-year-old daughter! 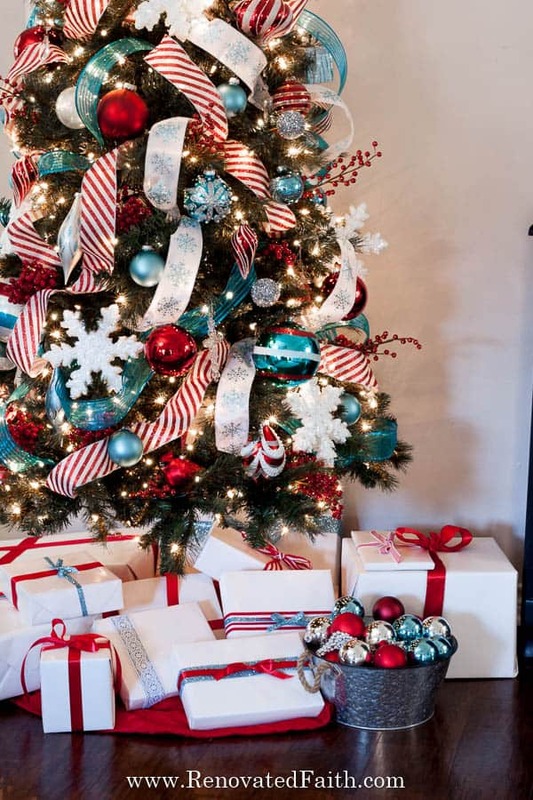 It was also fun to color coordinate the gift wrapping with the tree to make the look all come together. It was also a WHOLE lot easier to wrap all the gifts in white but they weren’t lacking for color with the sparkly ribbon! 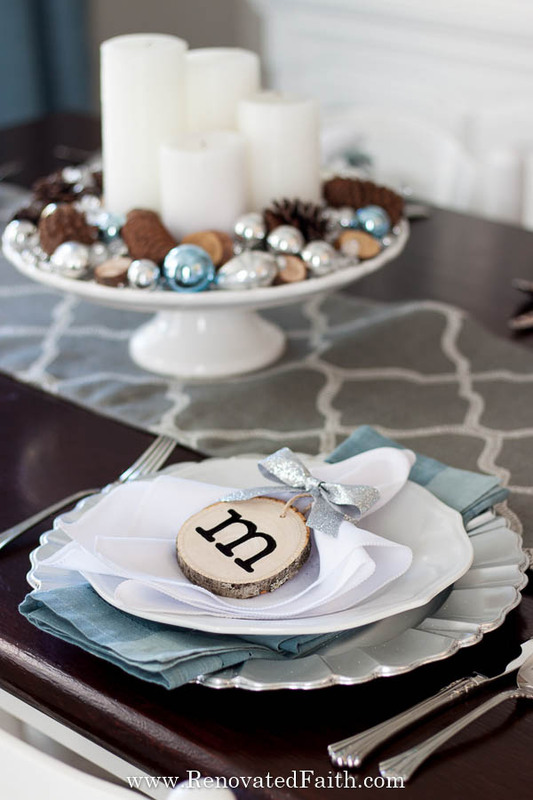 I’d also love for you to check out my post on how to do DIY Wood Slice Place Cards. 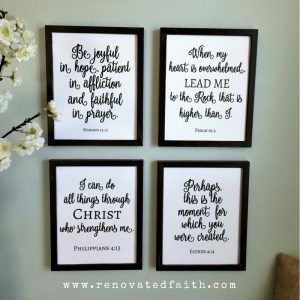 They also double as personalized ornaments for your guests!